Dorte Mandrup, Icefjord Centre, Ilulissat, Greenland. Photo courtesy of MIR. Extraordinary architecture is created from an understanding of the conditions relating to their specific context. A curiosity and tenacity to go above and beyond mere observation and towards an inquisitive, open, and highly subjective interpretation of all accessible facts, figures and feelings. When we place a building in a landscape we can evoke the distinctiveness of this particular place. Emphasize the drama and magnificence of a grand nature through the placement and shaping of the building. All endeavors must be carefully and cleverly choreographed around the contextual conditions. The relationship between the delicate physicality of a building and the vastness of the landscape that offers the potential of working within an immense range of scales. Spatially through architectural interventions linking the large scale of the natural elements to that of the body. Through way of several site sensitive landmark projects in relation to UNESCO protected areas, this lecture focuses on creating architecture based on particular conditions. 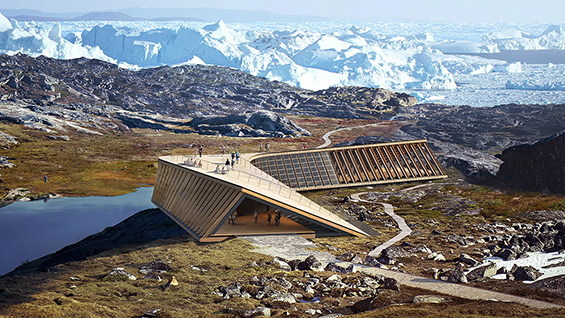 _ in particular two cultural buildings will be used as case studies, The Icefjord Centre in Greenland, 250 kilometers north of the Arctic Circle, and the Wadden Sea Center, a fully thatched exhibition building at the harsh west coast of Denmark. Dorte Mandrup is a Danish architect with more than 25 years of experience. As founder and Creative Director of her eponymous Copenhagen based studio, she every day inspires an international team of 70 dedicated people. Specializing in landmark projects crossing geography, function and scale, several UNESCO related projects underline an expertise in successfully anchoring buildings to unique sites and conveying a rich cultural history. Her work receives national and international acclaim such as the The Green Good Design Award by The Chicago Athenaeum, the Danish Wood Award, the Swedish Wood Award, the Bauwelt Award, the Eckersberg Medal, the Dreyer Foundation Honorary Award, The Nykredit Architecture Prize, The C.F. Hansen Medal, The Danish National Bank, Honorary Award, the, The Finn Juhl Architecture Award and latest the lifelong Honorary Grant by the Danish Arts Foundation. This year her immersive light and sound installation is headlining the curated, international exhibition at La Biennale di Venezia with an artistic interpretation of her cultural project in Greenland, The Icefjord Centre.